This beautiful and tasty classic cocktail has been an unfortunate platform to “create” a slew of flavor variations that have haunted the bartenders of years past (and still do in suburban strip malls). The Daiquiri was born organically if ever a cocktail was. By organic we mean of the climate and circumstance rather than the bright sticker on your banana that warns you that you will be paying 20 cents more per pound. Rum, lime, and touch of sugar are as satisfying as peanut butter and jelly. Squeeze the lime juice into your shaker and then stir in the sugar. Add the rum and a handful of cracked ice. Shake well and then strain into a chilled cocktail glass. 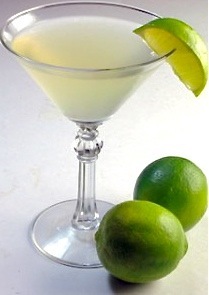 Garnish with a lime slice if you like.